New Delhi: India’s factory output growth slowed to 0.6% in August after expanding 2.7% in the previous month, data released on Friday show, suggesting that economic recovery remains tenuous. The manufacturing and mining sectors contracted 0.1% and 0.2%, respectively, in the month while electricity generation grew 7.2%, according to the Index of Industrial Production (IIP) data put out by the government. The Reserve Bank of India (RBI) is scheduled to announce its second-quarter monetary policy on 29 October. Even against the backdrop of weak economic growth, some experts expect the central bank to hike the repo rate to tame inflation. Inflation as measured by the wholesale price index, or WPI, quickened to 6.1% in August from 5.79% in July on rising food prices. Retail inflation, as measured by the consumer price index, or CPI, slowed for the second month to 9.52% in August from 9.64% in July. RBI governor Raghuram Rajan, in an interview that Mint published on 8 October, said he would take a call on the monetary policy after looking at the factory output and inflation numbers. The CPI and WPI data for September will be released on Monday. “I continue to say inflation is a primary concern. But the fight against inflation will take into account the state of the economy," Rajan said. The International Monetary Fund (IMF) said that in a number of economies, including Brazil, India and Indonesia, more monetary tightening may well be needed to address inflationary pressure from capacity constraints, which will likely be reinforced by recent currency depreciation. Since January, the rupee has weakened by about 11% against the US dollar and lost the third most after the Indonesian rupiah and Japanese yen in Asia. While output in the volatile capital goods segment, which represents investment demand in the economy, contracted 2% in August, basic goods and intermediate goods production expanded 1.5% and 3.6%, respectively. Consumer goods output also contracted 0.8% on a sharp decline in production of consumer durables by 7.6% for the ninth time in a row. Madan Sabnavis, chief economist at CARE Ratings, said the hope is that during the festival and the harvest seasons consumer demand will revive, which, coupled with some pick-up in investment, could bring about a turnaround. This, however, will be very gradual, he said. Finance minister P. Chidambaram said on Thursday the economy had shown early indications of a recovery with a pick-up in exports in the second quarter, the return of growth in the manufacturing sector and a reasonable rise in freight traffic. Rajan, in the interview, said the news on the Indian economy from now on will start getting better. He said strong farm output, speedy implementation of large infrastructure projects and high exports will help the economy bounce back in the second half of the financial year (October-March). But IMF forecast that India’s economic growth would fall to 4.25% in the year to 31 March in its World Economic Outlook report released on Tuesday, saying the economy would continue to underperform because of regulatory, infrastructural and financing issues. The projection is less than the government’s estimate of gross domestic product (GDP) growth of 5-5.5%. IMF said robust farm production will be offset by an anaemic performance by the manufacturing and services sectors, and that the current monetary tightening will crimp domestic demand. “I know that the World Economic Outlook report does not share my optimism, but I may tell you that we do not share their pessimism," Chidambaram said. India’s economy grew by 4.4% in the three months ended 30 June, its slowest quarterly pace in four years. In 2012-13, economic growth at 5% was the slowest in a decade. The Asian Development Bank on 2 October slashed its growth forecast for India to 4.7% for 2013-14 from 6% earlier. 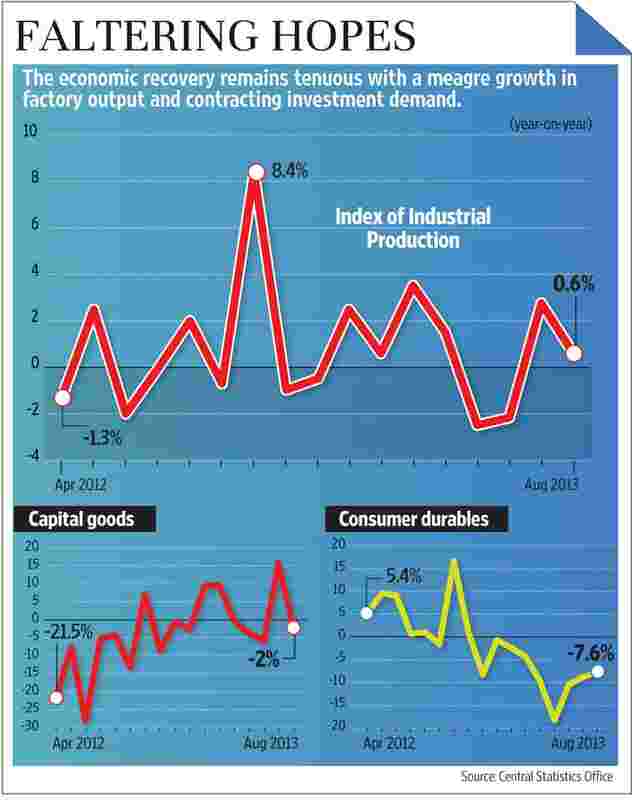 It expects economic growth in India to pick up in 2014-15 to 5.7%, down from 6.5% projected earlier. The finance ministry, in a quarterly review of the economy for the April-June period posted on its website, said current macroeconomic trends indicate that a combination of global and domestic developments is likely to result in a “shallow U" shaped recovery in 2013-14.